I guessed right! Wheee! That's a little gross, but actually kinda cool. If that's all you eat, do you end up with a non-rotting body. that is DISGUSTING!!! i dont even WANT to know what sorts of preservatives are in that burger. this reminds me of the movie "super size me"
My friend did a research report on the effects of fast food on the body, and she kept Mickey D's french fries in a plastic bag for three weeks. They didn't even begin to decay. That is so gross! Has anyone tasted that 12 year old burger? I wonder if it still tastes the same. But that is just off! 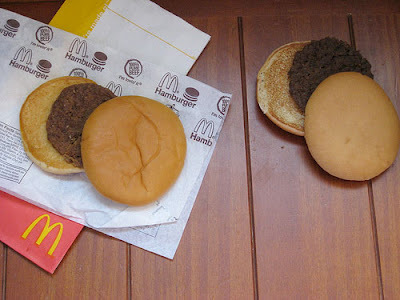 My core teacher is crazy, and she keeps around an old burger to show that when something in late, it is not as good as when it's on time (weird comparrason) Anyway, she took it out one day (a month old by this point) and one of that pattys that had been soaked in speccial souce was shrunk! So it was like half the size!!! Then, she through the burger at the wall and it shattered! Like glass! Your core (homeroom sorta thing) teacher soaked it wierd sauce? Huh. Well that's weird, but fortunately I am a vegetarian and HATE McDonalds. i read that there is cow POOP in the McDonald's meat. and a fast food restaurant can have 187 health code violations before it gets shut down. and its not required for them to wear hairnets or wash their hands before preparing food! Also: for all those vegetarians out there McDonald's fries are NOT vegetarian they use beef and chicken oil to deepfrie their fries in! and they only wash the friers once every month and a half. A Society of Rogue Knitters?